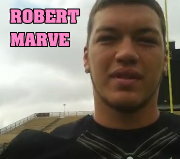 Remember Shula Recruit Robert Marve? He is still playing! 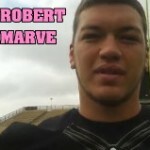 Remember the prized QB prospect, Robert Marve, from Florida? This former high school star is still playing in college! I found this fascinating seeing how Shula almost brought him to Tuscaloosa. Everyone had high hopes for him coming out of high school when Shula tried to reel him in? As a high school player, Marve was named Florida's Mr. Football and member of Parade All-American team as senior at Plant High School in Tampa, FL. In fact, he broke three state season records including those of Tebows. What happened to him in college? Marve choose Miami to continue his football career, and sat out his true freshman season after suffering a broken arm in a car accident over the summer. He became the starter for the 2008 Hurricanes squad, leading them to a 6-5 record before being replaced by Jacory Harris for the final regular season game, and the bowl game. Three days after the bowl game, Marve announced that he would be transferring from Miami, citing that he had decided he, "...couldn't play for coach Shannon". After a dispute about where Marve would be able to transfer to, he decided on Purdue on May 20, 2009. After his transfer, Marve tore his ACL during summer practice, but did not miss any time, as he had to sit out a year due to NCAA transfer rules. In 2010, Marve won the starting quarterback position and started the first 4 games of the season, going 2-2 before re-tearing his ACL, ending his season. In 2011, Marve had been named the backup quarterback to Rob Henry. But when Henry went down with an ACL tear of his own a week before the first game, Marve was not ready to become the starter with soreness still in his knee. He sat the first two games of the season, before returning to backup Caleb TerBush the entire season. Marve was granted a sixth year of eligibility by the NCAA, after missing multiple seasons with injuries. He returned to Purdue, and was named the backup to TerBush once again in 2012. But one day before the Boilermakers first game, TerBush was suspended and Marve was named the starter. Marve responded with his best game to date as a Boilermaker, throwing for 295 yards and three touchdowns. So far this season, Marve is 41 of 56 for 414 yards with four touchdown passes and an efficiency rating of 155.3 this season. But he is hurt once again. This time an ACL. We have a link to the article below. Winding road for an ex-Alabama commitment... makes you wonder if he would have been better off with Bama's offensive line, or just killed in practice? Well..... we will never know!